Browse through our patio cover gallery to find various samples of styles and materials. Patio covers transform a simple patio deck into a cozy, shaded outdoor living area that’s excellent for children to play in or cozy for entertaining friends and family. They are also a cost-efficient way to create an outdoor living space. Like most canopies, our Houston patio covers attach to the home that’s why Patio Creations pays particular attention to how we attach and weatherproof them. Traditional patio covers are lattice, solid, or a combination. More upbeat designs for patio covers are those made from strong cloth, colorful vinyl or huge patio umbrellas. Other elements to consider in a patio cover design are electrical accessories like outlets, fans, and lights. 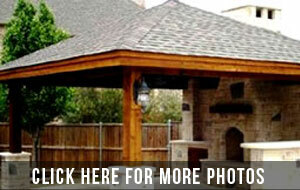 Fireplaces, kitchens, and even a fountain can be considered when installing a patio canopy. Patio Creations is backed by 20 years of expertise. We build and install custom-designed patio covers Houston residents are sure to admire. Give us a call today. We offer no-obligation consultations on any of our patio services.